Click here to watch last night's Monday Night Live (in Windows Media format). This was the first time that I'd co-hosted a full show and the first time that I'd ever done one with regular host Ken Echols. I had a lot of fun doing this last night. We got to show a little bit of Schrodinger's Bedroom and the show closed out with the final moments from Forcery (including the credits with Slim Whitman singing "Una Paloma Blanca"). I also got to give a shout-out to friends in Raleigh, Waynesville, and Bellingham in Washington (so hey to Chad, Ed and Jenna). 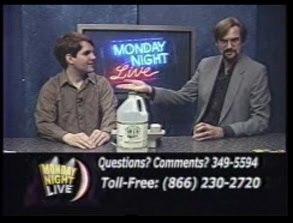 And of course no episode of Monday Night Live would be complete without a call from Jaybird in Eden. So if you want to watch your good friend Chris in action, mash down on the link above and catch the show.